Over the last few years, Israel has become one of the most important technology and start-up hotspots in the world. 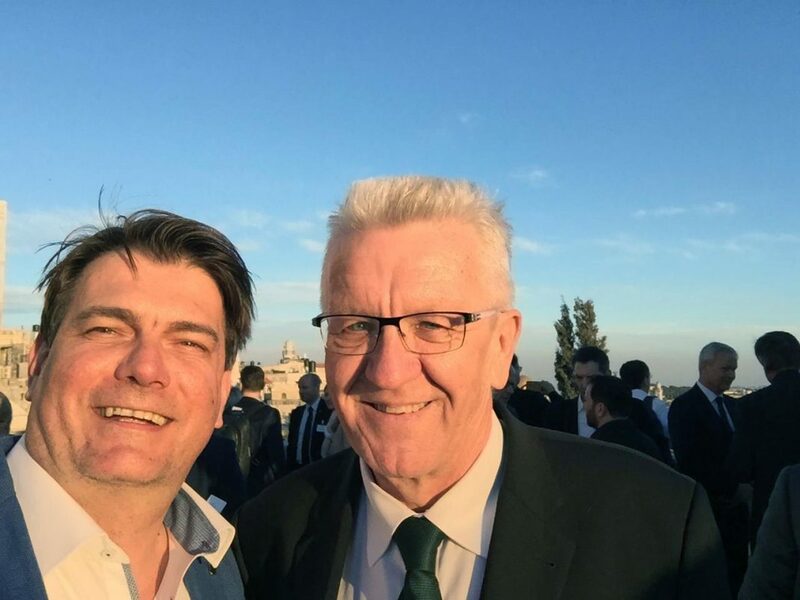 In order to find out about current developments in the Israeli start-up scene, a delegation from Baden-Württemberg headed by Minister President Winfried Kretschmann and Minister of Economics Dr. Nicole Hoffmeister-Kraut recently travelled to Tel Aviv and Jerusalem. David Hermanns, CEO of CyberForum, also participated in the trip and described his impressions. Even before we had arrived in Israel – on the way from the airport to the hotel – I was asked by my Iraqi taxi driver whether I had already noticed that "we" sold the company mobileye for 15.3 billion EUR to Intel? And with "we" he meant the nation of Israel. This small country has the greatest start-up density and the highest risk-taking rate in the world, he told me proudly. Years ago he had recommended his rich uncle from America to invest 5,000 EUR to make at least 100,000 EUR profit, he told me. On top of that he explained his uncle at last ended up earning 180,000 EUR. It followed a detailed description of the company, the product and the 600 million exit. Whether the uncle was really out of the deal with a plus of 175,000 EUR or whether my taxi driver fantasized, it doesn’t matter. I was impressed. Not by the story itself, but by the vigor and enthusiasm of my new acquaintance. In Karlsruhe, you would have to look for a taxi driver who identifies himself with the startup scene or advises his relatives to take risk investments. During my trip I realized why whole Israel identifies with the startup scene. But let’s start at the beginning; and with some background information. Israel has neither a strong domestic market nor global players are present in Israel. Despite, the country on the Mediterranean Sea has an excellent research landscape, excellent international business relations and one of the most advanced armies in the world with high-tech equipment. This did not look very different from before. About 15 years ago, the country stuck in an economic crisis. The gross domestic product in 2002 amounted only 121.1 billion US dollars and shrank by 1% compared to the previous year. The per capita income actually decreased by 3%, reaching the worst result in 50 years. For comparison: in 2016, the gross domestic product amounted 287, 8 billion US dollars. The country had to do something and therefore it launched a major offensive (no military!) to transform its scientists into entrepreneurs. Israel set up a long-term strategic program to strengthen its economy. On the one hand, 10 funds each amounting around 20 to 30 million euro venture capital were established by the state. These funds are now all privatized. On the other hand, so-called liaison officers were employed at the research institutes with the task of identifying innovations and leading them to success together with the entrepreneuers. Additionally a number of incubators have been set up to work closely together with the research facilities. This big offensive was fruitful, as a result the research institutes yield manyspin-offs, so that Israel can now look at more than 5,000 Israeli start-ups. Only Silicon Valley has produced more companies worldwide. Impressive, right? I was also able to witness the innovative power of the big-scale offensive, the long-term strategic program, at the Jerusalem Venture Partners. Founded in 1993, the venture capital company, with its focus on digital media, business software and cybersecurity, selects five business ideas each year from thousands of applications, in order to establish them on mature markets. At the start of the program, each of the selected companies receives 500,000 EUR to develop a so-called Minimum Viable Product (MVP). The respective incubator will also receive 100,000 EUR for the sustainable support of the founders. After 6 to 12 months of incubation, large conglomerates and global players evaluate if the MVP can cover the market requirements. If this is the case, the startup for the completion of its product will initially receive an investment of 1 to 2 million EUR and then again 10 to 20 million EUR to conquer the international market. But even more than all the incubator programs and startup funds the Israeli spirit fascinated me. But the question is: What makes people so risky there? An explanation attempt came from Dr. Erel Margalit, one of the founders of Jerusalem Venture Capital. He said the risk affinity lies in an anti-authoritarian gene that all Israelis had in common. Another reason might be the education: children are given a lot of independence and therefore many children are independent and bold even at a young age. In addition, the risk affinity can also be attributed to the social and political situation in Israel. Nobody knows what is coming tomorrow, which is why everyone has a certain ability to improvise. And so the doctrine, even if there is no precise plan, always exclaimed is "You have to complete your mission!". And this inner attitude also leads to the fact that Israelis are founding with a strong commitment and an unyielding will. What can Baden-Württemberg's founding landscape learn from Israel? And that's what I'm taking home: we must complete our mission and make Baden-Württemberg the start-up location in Europe. The preconditions for this attempt are good: with the strong Mittelstand and large corporations such as Daimler or Bosch, we have the customers for young businesses right in front of the door. But it requires a long breath. Israel has set the course for today's success 15 years ago, with a clear and long-term strategy. On the other hand, many support programs in Baden-Württemberg seem to be well-intentioned, but they are too short: many of the local funding programs are mostly based on ESF programs with a fixed project duration and can therefore never experience such a stabilization as the Israeli programs. In addition, the amount of funding for start-ups in relation to the total budget is still very manageable. We can also learn from Israel how to promote our business location: at all times and at every station on our journey, the same numbers, data, facts and claims were presented to us. There are no lone fighters. Everything was from a single cast. This is lagging here. Anyone who comes to Karlsruhe, Stuttgart or Mannheim will always be confronted with the respective region and never with Baden-Württemberg in a whole. A coordinated and concerted strategy would help Baden-Württemberg start-ups to internationalize and conversely to bring international start-ups into the country. This is indisputable. At the Baden-Württemberg start-up summit on 14 July, Minister President Kretschmann and Minister for Economic Affairs Dr. Hoffmeister-Kraut introduce new funding programs for the start-up country of Baden-Württemberg. I am anxious to see if they are lighting a Moonshot startup program for Baden-Württemberg. It is necessary! Let's tackle it. Complete your Mission!